First, and most important, before you can use the widgets included in the Widget Pack you must first install the Connections Business Directory plugin. Follow this link to the installation instructions. You install the Widget Pack extension like you would any other WordPress Plugin. Follow these steps. First navigate to the Plugins menu and click Add New. Next click the Upload Plugin button at the top of the page. Now browse to where you downloaded the Widget Pack zip file and select it. Upon successful installation, click the Activate Plugin link. Set the Directory Home Page. This will be the page in which all widgets interact with. After you have activated the Widget Pack extension then navigate to the Connections : Settings admin page and click the Licenses tab. Enter the support license key that you received in your email receipt and then click the Activate button. With your support license key activated and when there is an update, you will be notified in the WordPress admin. Now you will be able to update to the latest version when notified with a single click. Search :: This widget displays a keyword search field. Your users can use it to search your directory. Category :: This widget displays a list of category links. List :: This widget displays a limited list of entries from your directory. The list can include or exclude entries from specific categories. Anniversaries Today :: This widget displays a list of today’s anniversaries. Birthdays Today :: This widget displays a list of today’s birthdays. Upcoming Anniversaries :: This widget displays a list of upcoming anniversaries. Upcoming Birthdays :: This widget displays a list of upcoming birthdays. Recently Added :: This widget displays a list of recently added entries. Recently Updated :: This widget displays a list of entries that were recently updated. Before you can add a widget you must verify that the theme you are using supports widgets. You can do so by navigating to the Appearance menu and looking for a sub menu titled Widgets. If the sub menu exist then your theme supports displaying widgets. Navigate to Appearance > Widgets page in the WordPress admin. Choose a widget and then either drag it to the sidebar where you wish it to appear, or click the widget, select a destination sidebar if your theme has more than one and then click the Add Widget button. Once you add the widget, WordPress will automatically save the widget with its default settings. To configure a widget you must first add your chosen widget to the theme’s sidebar. Many of the widgets share the same set of options. You will list the options under each widget, even though it is duplicate information, for completeness. The search widget has a single option, the widget Title. The default title is “Search Directory”. You can change the title to be any text that best describes it on your website. Display all categories or include specific categories or exclude specific categories. Choose to limit the list to a defined category and decide whether to show only the immediate children categories or to show all descendant categories. When displaying all categories you can choose to limit how many levels deep the category tree should display. Decide whether or not to show the number of entries assigned to the category. You can choose whether or not to hide empty categories. Include or exclude entries based on their assigned categories. Control the formatting of the name . You can optionally display the name as a link to the entries profile page. Decide which sidebar from which you want to remove your widget, if there is more than one option. To remove a widget, click the name of the widget to remove or the down arrow in the upper right corner to expand the widget’s options. Click the Delete link at the bottom of its options to permanently remove the widget. Click on the widget title and hold the mouse button down. Then drag the widget up or down to the desired location. Now release the mouse button to drop the widget in to the new location. 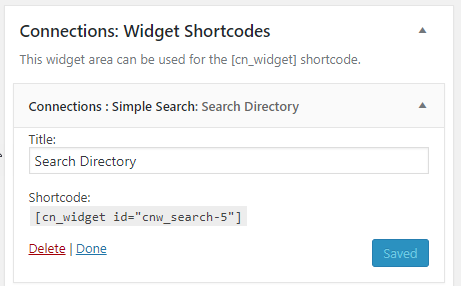 You will have the ability to display each of the included widgets on the page with a shortcode.You will find a new sidebar name Connections: Widget Shortcode on the Widgets page in the WordPress admin. Add the desired widget to the this sidebar and configure it you normally would. After you click the Save button you will receive a shortcode that you can place in to the page. Updating from Widget Pack 1.x to 2.x should be fairly quick and easy. First, deactivate Widget Pack 1.x. Now follow the Extension Installation Instructions. Go to the Connections : Settings admin page and enter your support license key under the Licenses tab. Lastly go to the Widgets admin page, add and configure your new Connections Widgets. Please be sure you follow Step 4. After you add your support license key, you will receive update notification in your WordPress admin everytime an update for the Widget Pack is released. This will also also enable inplace, single click, updates. NOTE: This is a major update, you may have to re-add and configure the Connections Widgets that were placed in the theme’s sidebars.